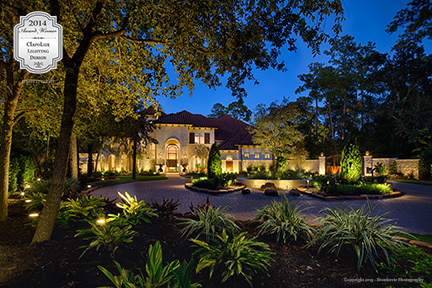 Is Your Landscape Lighting Business Needing More Exposure? To receive national recognition of your beautifully illuminated landscape lighting projects, enter ClaroLux’s® Lighting & Design Photo competition! The contest is open to all of ClaroLux’s authorized Dealers and is FREE! ClaroLux’s® goal with the nighttime photo contest is to help inspire all of our Dealers be the best that they can be with a little friendly competition. With the ClaroLux® Lighting & Design contest it enables our authorized Dealers to show off their best work. Winners of the contest will not only be given national exposure in ClaroLux’s® advertising material and website but will also receive great rewards. When our Dealers learn about the Lighting & Design photography contest, they realize not only can they win prizes, but their photos will reach countless customers who will view their design and installation of a beautiful landscape lighting project. This year ClaroLux® will be offering rewards to the winner of each category. ClaroLux’s® Lighting & Design Award winners are judged against projects submitted from ClaroLux® lighting contractors throughout North & South America. Winning entries are determined based on various criteria including design creativity and techniques, project implementation, technical specifications, and overall continuity. Winning entries will be announced January, 2016. ClaroLux® is now accepting entries; please send entries to info@clarolux.com; attn: Lighting & Design Award Contest. The deadline for ClaroLux’s® photo contest is December 22nd, 2015. We look forward to seeing all your entries! How can you set yourself apart from the competition, gain respect, acquire knowledge and invest in your future? By becoming certified!!! Become a CLVLT or sign up for the COLD program at the AOLP Annual Conference & Expo being held the week of February 16-20, 2015, at the Embassy Suites Atlanta – Bulkhead in Atlanta, GA. The annual AOLP Conference & Expo is praised among members for its educational and networking opportunities. It’s also the perfect time to become certified. seo website analysis report For your convenience, the CLVLT exam and COLD sessions are held in the days prior to the conference at the conference hotel. If you have any questions about these certification programs, please contact Kelly at 717-238-2504 or certification@aolponline.org. For more information on COLD, click here. For more information on CLVLT, click here.